We have been lamenting our lack of inventory for a considerable time (which makes us feel a bit like a broken record) and that same tune was replayed during the first half of this year. January-June 2014 served as a textbook example of the effects of low inventory, with sales down from last year even though there was plenty of demand. This demand, however, pushed the prices of the existing homes up sharply and as the seasonal inventory surge took place in April and May, things got a bit crazy. When we look at “closed sales” we must remember that the bulk of the houses were actually “sold” 30 to 45 days earlier. Over the winter, we saw historically low inventory levels. Then, during the start of the second quarter in April and May, our closings were off 38.2% from the same period last year. The month of May was particularly pathetic, with closings down 58% from 2013, but we weren’t worried because we were selling almost everything that came on the market. This was reflected in June’s 51 closings, which tied our eight-year record for the number of closings in one month. Also, June’s average selling price of $736,611 was up 21% from last June’s closings. These are exciting and encouraging numbers, but we must be careful in comparing one single month to another. The “cumulative days on market” (CDOM) statistic for these past six months illustrates how fast our inventory is turning. The lower the CDOM number, the faster homes are selling. (Another indicator is months of supply, which is calculated by the number of sales during a period of time – typically the past quarter – and the number of homes on the market.) For the first half of this year, the CDOM was 72 days compared to 105 days for the same period of time last year. The CDOM for homes that sold in May was only 41 days, and only 64 for homes that sold in June! There is no clearer measure of how quickly new listings are being snatched up. Other good news is if you look at the statistics (other side), you see a relatively balanced market, with homes selling in all price brackets. We have already sold four homes in our “upper end” (over $2M), which doubles what we sold at that end of the market in 2013 and 2011, and matches the sales from 2012, when we had a particularly strong first half in the upper end. Sales (as opposed to closings) were strong in June, although they did not reach May’s levels; and so far July is also strong. With all the positive news regarding employment growth in Seattle, bridge issues and traffic, it is easy to be pretty darn positive about our market. What about condominiums? The condo marketplace has been tough, especially for homes over $400K, but the first half of this year signaled a distinct recovery, specifically with regard to prices. In 2012, 94% of the 34 condominiums sold came in at $400K or below (meaning only 6% were above $400K). This improved to 67% in 2013 (33% over), but only one unit sold for more than $600K. This year the number of homes priced under $400K was 62% (38% over) with seven over $600K and four over $1M. There were a total of 53 condominiums sold in the first half, up 32.5% from last year. Inventory has also been a big story in condominiums. On July 1st, there were a total of 38 listings, of which 16 were sold (under contract but not closed). To compare, in 2007, at the beginning of July there were 111 listings, and this was before our correction began (which we pin at about September 1, 2007 at 5:00 pm). In the $600K-$800K range, there has only been one listing since the beginning of the year, and it sold immediately. On July 1st, there were no listings in that price range. At mid-June, the number of condominiums under contract was 59% of the 37 listings. At the same time, the percentage of condominiums under contract priced at $400K or less was 63%! Not surprisingly, the average price for the marketplace has jumped 24% over last year ($403,506 in 2014 versus $324,256 in 2013). There is demand! Land sales have not been as exciting as homes or condominiums, but they have been steady. Sales are a bit off from last year (23 this year versus 28 last), but still way ahead of the 9 sales in the first half of 2008. Both average and median prices showed gains (average up 10% and median up 7.4%). There was an interesting sale at the end of June: a 4.5-acre lot on the south side of Wyatt Way came on the market for $1,950,000 as a “multifamily” site. It was un-der contract “pending feasibility” in less than 10 days. The developers are here! The 2014 Bainbridge Rotary Auction grossed over $466,000, a new record high. Event organizers hope it will net in the neighborhood of $400K. 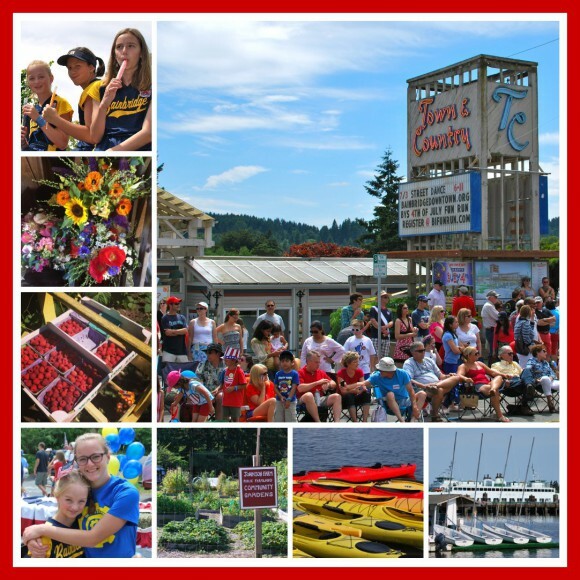 This is a colossal effort by Bainbridge Island’s Rotarians and an army of volunteers, over 1,400 this year! Not one penny from the auction goes to the club. The funds are put into a trust account and disbursed in three segments. The first third (~$130,000) goes to “Community Grants” to non-profits with requests of less than $15,000. It might be hard to find an established non-profit on the island that hasn’t been a recipient of one of these grants over the years. The second third goes into the Judge Huney Fund, which contributes to major projects. Our pools, library, parks and currently the Weaver Avenue baseball field and park have been recipients of these funds. The last third is split among local youth, miscellaneous needs and international projects. Youth includes educational and vocational scholarships, leadership camps and other community efforts and the international include water projects in Africa and Central America as well as education projects in both areas. This phenomenal event comes together with the help of generous community volunteers and donors who turn people’s cast-off “stuff” into hundreds of thousands of philanthropic dollars in a span of less than 10 days. A pretty cool feat, and a uniquely Bainbridge tradition. Around here we all say there is no better place to be in the summer than the Pacific Northwest. True story. For our family summer means a lot of sports. From soccer to softball to crew my kids are in it and we are there watching and driving them to and from. Being just the other side of the 4th of July I can honestly say this island puts on a great celebration. From the 3rd of July Street Fair to the 4th of July Parade to the Fireworks at night, it was quite a holiday weekend. This year we even got a shout out on the Today Show as one of the best places to spend the 4th of July. Many folks here think summer officially starts after the 4th of July. 1. Participate in the All-Comer Races at the Bainbridge High School track – all ages welcome. July 7th – August 25th 2014, 6:30pm start time. 2. Enjoy a Wednesday Summer Concert in the Park, Sounds of Summer sponsored by the Parks and Recreation Department. July 9th – August 20th at Battle Point Park. 3. 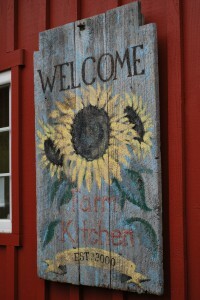 Pick strawberries or raspberries at the Suyematsu & Bentryn Farm. 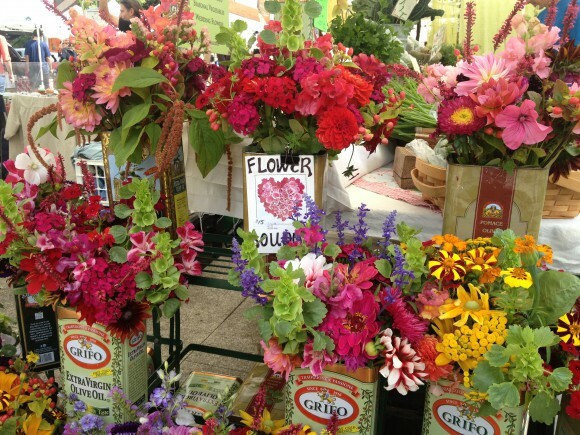 While you are there you can also buy farm fresh vegetables. 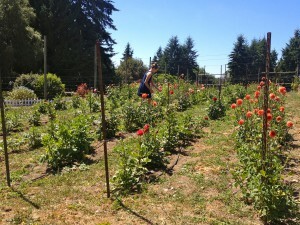 Or just down the road cut colorful dahlias and pick blueberries at the Bainbridge Island Blueberry Co.
4. As August approaches the island becomes one great big blackberry patch and the picking is abundant and free. Fort Ward Park and Battle Point Park are great locations. After you pick a batch make blackberry muffins or blackberry ice cream. 5. Summer nights are best spent at a beach. Lytle Beach and Treehouse Cafe Pizza are my favorite combination. Rockaway Beach and Fay Bainbridge Park are also picturesque spots to enjoy a summer evening picnic. 6. If the heat of the summer gets too high, a hike in the Grand Forest is a nice place to cool off in the shade of the stately trees. This map is a great resource too for island-wide trails. 7. Renting a boat at the Back of Beyond on Eagle Harbor is a great way to get out on the water. Canoe and kayak rentals have many flexible rental/time options. 8. Cool off at the Bainbridge Library and if you have kids sign them up for the Summer Reading Program. Afterwards, make a stop at Mora Iced Creamery (their seasonal blackberry ice cream is terrific by the way) or Sunshine Yogurt to make a sweet toast to summer. 9. Enjoy a nice meal outside, either on your own back patio, the Harbour Public House or The Beach House at Pleasant Beach Village. 10. If you are the adventurous type you can join the crew that regularly jumps off the Point White Pier at summer evening high tide. Fun to watch even if you are not up for the challenge.